A hand barrow is traditionally used in construction sites. It is used to carry the construction material from one place to another. This is a small hand propelled vehicle usually with just one single wheel designed to be pushed and guided by a single person using two handles at the rear. Though this has been replaced with advanced carrying machines, but still it holds its symbolic importance. This is still used in many parts of the world and under developed countries. We are going to make a caricature of this hand barrow to be used as a centre piece on the table, and we are going to recycle it with the wooden pallets. A centre piece is anything that can be used to enhance the beauty of room interior, so caricature of this delicate tool is a perfect example of a traditional centre piece. The picture shows it clearly that some of the finest pallets are used in making this tiny caricature or centre piece. 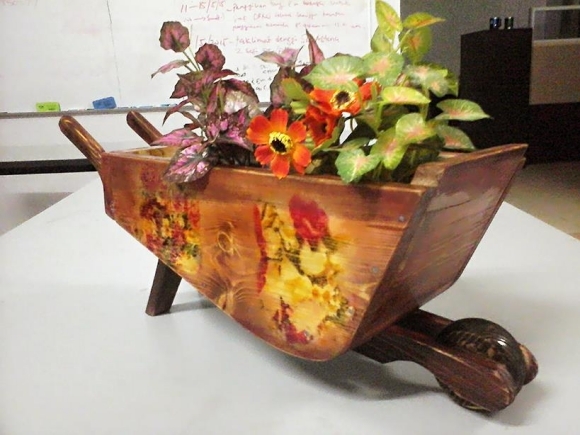 It is designed pretty according to the shape and design of an actual hand barrow. It has a single wheel on the front, two handles on the rear, plus a supportive stand too on the back so that it could be managed to stop without falling. 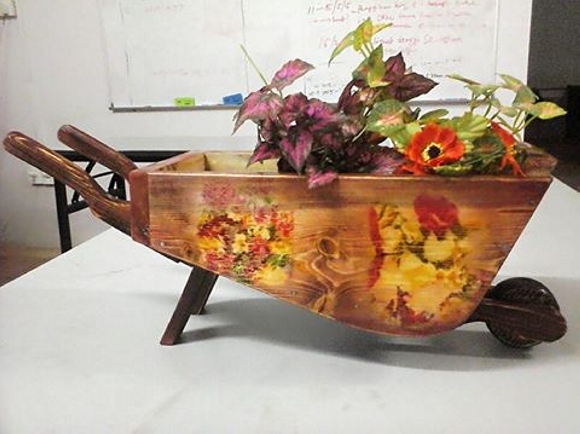 So this is a perfect imitation of a hand barrow, but here it is used as a centre piece to be placed on the table, this hand barrow is completely recycled with the wooden pallets. This is used as a beautiful wooden vase. Use this centre piece putting on your dining table or your bedroom side table. Such artistic caricature really make us feel pleasant and relieved as well. Try recycling something different with wooden pallets into a centre piece that can be placed on a table.